For those of us who do not use the Newsstand feature of iOS its constant presence on our iPhone’s or iPad’s homescreen can be very annoying. Apple does not give an option to turn this feature off nor does it allows users to put Newsstand into a folder. Thankfully though there is a way using which you can hide Newsstand from iOS’s homescreen. Side Note: iOS 7 beta allows users to put Newsstand into folders. Lets hope Apple keeps it that way when the final version of the software is released in September. 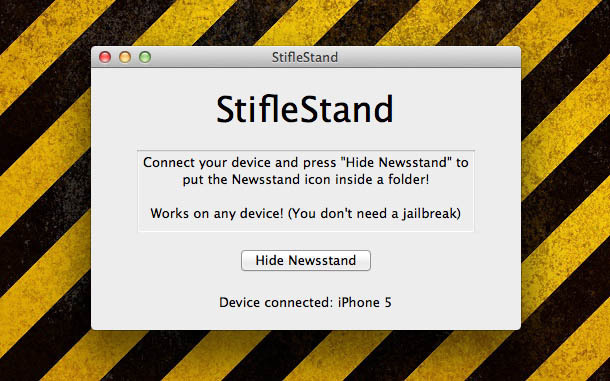 You can hide Newsstand from homescreen of your iPhone, iPad or iPod touch using the desktop app called StifleStand. The app is developed by infamous iOS hacker Flippo Bigarella and is available for both OS X and Windows platforms for free. This method works on both jailbroken and non-jailbroken devices. Using StifleStand in order to hide Newsstand from iOS’s homescreen is pretty easy. You just have to connect your iOS device to the computer and launch the StifleStand app. Once it gets recognized by the app all you need to do is click on the ‘Hide Newsstand’ button. That’s it. Go ahead and give this method of removing Newsstand icon a try.